Oftentimes when I buy a new cookbook, I feel overwhelmed by all of the recipes, and I have a really hard time deciding what to make first. With every page that I turn, I decide that "No, THIS is what I want to make first." Whenever this happens, I give the cookbook to Joey and let him decide. Such was the case with Ellie Krieger's So Easy. I pretty much wanted to make every single recipe I came across, so in the interest of saving myself the agony of making such a monumental decision, I let Joey be the judge. We all really love mango, so I wasn't too surprised when Joey chose the Pork and Mango Stir-Fry. We also love meat with fruit, so this was kind of a no-brainer. 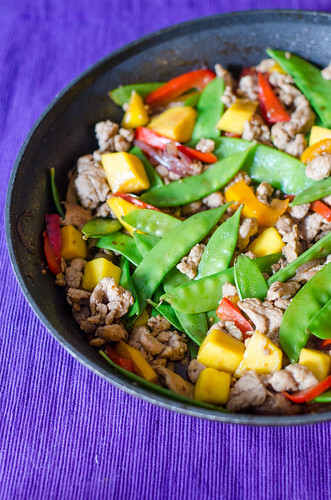 The sweet mango pairs so nicely with the tender pork and the other veggies in the stir fry, and it's all pulled together with a sweet-spicy-salty Asian sauce. This is colorful, healthy, and it was a big hit with the whole family. Caroline and Smith loved to tell us which colors they were eating, and which was their favorite (for the record, Smith just parrots everything Caroline says). Even though chopping and prepping the veggies and pork takes a bit of time, the dinner comes together quite quickly once you get started - so definitely measure out the ingredients for the sauce and have everything else ready to go once you start. Dinners like this make it easy to stick to your New Year's resolutions - quick and easy, healthy, and a pretty darn good substitute for Chinese take-out! Psst - I'm including the nutritional info because it's provided in the book. Since I've been counting calories, I've been calculating the nutritional info for most of my recipes - is that something you would be interested in seeing for future posts? Whisk together the chicken broth and cornstarch in a small bowl to dissolve the cornstarch. Set aside. Using a food processor with the slicing attachment, pass the pieces of pork tenderloin through to thinly slice. Alternatively, use a knife to slice the pork as thinly as possible. Heat 2 teaspoons of the oil in a wok or large nonstick skillet over medium-high heat. Add the pork, season lightly with salt and pepper, and cook, stirring occasionally, until just cooked through, about 4 minutes. Transfer the meat to a plate and set aside. Meanwhile, in a small bowl, whisk together the sherry, soy sauce, Chinese five-spice powder, and red pepper flakes. Set aside. Heat the remaining 2 teaspoons of oil in the now-empty skillet. Add the onions, peppers, ginger, and garlic, and cook about 3 minutes, stirring constantly. Add the snow peas, the cornstarch-broth mixture, and the sherry mixture, and toss to combine. Cook until the peas are crisp-tender and the sauce is slightly thickened, about 3 minutes. Return the pork to the wok, and stir in the mango. Cook an additional 2 minutes, or until the pork and mango are heated through. Taste and season with additional salt, pepper, and red pepper flakes as needed. Serve over brown rice. I definitely get overwhelmed by my cookbooks sometimes! I want to make everything and simultaneously nothing lol. This looks like a great stir fry! Definitely a great way to stick to your resolutions! I am a huge Ellie Krieger fan. Her recipes are so healthy without being rabbit food. This looks fantastic. We love chicken mango stir fries, and in the summer, we love chicken and nectarine stir fry...yum! Thanks for the recipe. It looks like a winner! I've tried inserting calorie information on my blog here and there. For some recipes, it's easy but for others it's really hard because the nutrition information seems to vary so much based on the brand of ingredient used. I guess it's still a good guidepost though....lots of people are interested in health and nutrition! Chicken and nectarine stir-fry sounds great - I'll have to remember that for this summer! I agree that it can vary so much - even just based on the size of your fruit or vegetable or protein. I have had people request it a few times in the past, but never really thought about including it. Maybe I'll just do it here and there too, when I feel like it would be useful. Thanks for your thoughts!